Ema Fataluku iha Timor-Leste iha kultura oi-oin ne'ebé forte. Many Hands International hala'o peskiza kona-ba kultura Fataluku ne'ebé ameasadu atu lakon durante tinan ida nia laran iha Postu Administrativu 3, Lospalos, Lautem no Tutuala. Liu hosi estudu ne’e MHI identifika tiha ona elementus Kultura Fataluku liu tolu-nulu. Projetu ne'e koko atu hamoris fila-fali elementu kultura ne'ebé ameasadu atu lakon liu hosi halo dokumentasaun kona-ba elementu kultura sira ne'e; harii kapasidade iha nivel lokál atu bele preserva patrimóniu kulturál; no fó ema Fataluku oportunidade atu haree no aprende kona-ba sira-nia patrimóniu kulturál. o	Tradisaun oral sira no espresaun sira. Favor, nota katak website ne'e la completu. Ami sei continua atu aumenta ho informasaun no video sira. Obrigada barak ba University of Melbourne mak supporta ita atu realiza website ne'e hus Conceder Communidade. The Fataluku people of far eastern Timor-Leste maintain diverse and unique forms of cultural expression. However, there are many forms of cultural expression that are now endangered. Many Hands International's research project, Preservation of Endangered Forms of Fataluku Cultural Expression, recorded 30 different cultural heritage elements (many practiced in different forms) in the municipality of Lautem between 2012 and 2013. The project sought to help re-invigorate critically endangered forms of cultural expression by recording those cultural forms, building local capacity to safeguard cultural heritage and providing Fataluku people with an opportunities to view and learn more about their cultural heritage. This website presents in gallery format the video recordings from the Many Hands International research project. In the videos, community members share their knowledge and practice of endangered forms of Fataluku cultural expression. The recordings are organised into 'items', 'collections' and 'exhibits'. You can see a list of each form of expression of different cultural elements by clicking on 'Browse Items' in the menu at the top of the page. Each item title is written in Fataluku, followed by the Tetum and English translations in brackets. The title includes the name of the form of cultural expression and the aldeia (village) it was recorded in. Click on the title to see the videos and read information. If you click on 'Browse by Tag' in 'Browse Items' and click on a tag (word), all items related to this tag will be shown. Tags include the names of the different forms of cultural expression, the places the videos were recorded and the name of the people sharing their knowledge. Tags are in Fataluku, Tetum and English. - Knowledge and practices concerning nature and the universe. Please note that this website is a work in progress and we are still uploading and organising items and creating collections and exhibitions. Many thanks to The University of Melbourne for its support in creating this website through a Community Engagement Grant. 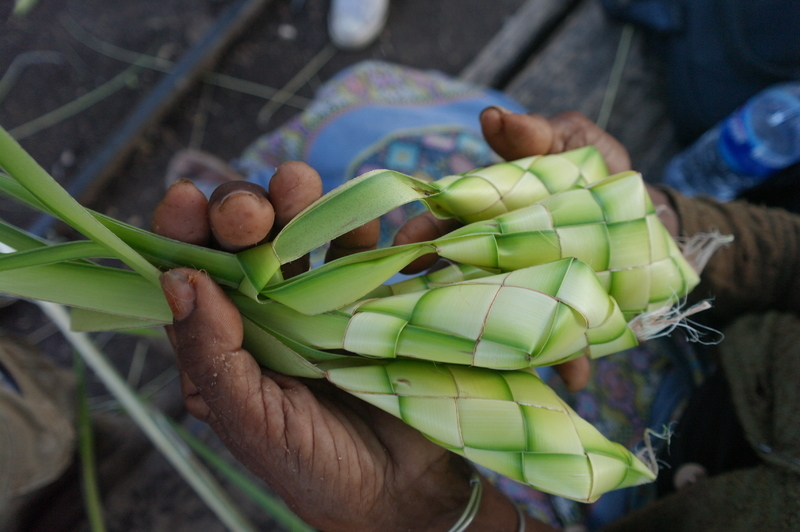 “Konaba website ne'e no oinsa atu uza / About this website and how to use it,” Kultura Fataluku Lautem - Many Hands International, accessed April 26, 2019, https://omeka.cloud.unimelb.edu.au/kulturalautem/items/show/55.